There are so many aspects of the contract management process that can be run so much more efficiently. We built Folio to address the key issues that contract managers faced and to provide them with a tool that would make their work easier. One of the problem areas that we tackled recently is contract correspondence. Contract management usually involves a great deal of correspondence, there are emails, documents, images and more that need to be stored, sorted and shared. While teams may store files and attachments in a document management system or in shared folders, emails tend to stay in their email client and can easily be misplaced. So we built a feature called Email to Folio that helps users manage emails and attachment better. Users can easily forward emails to Folio, no need to save and then upload. 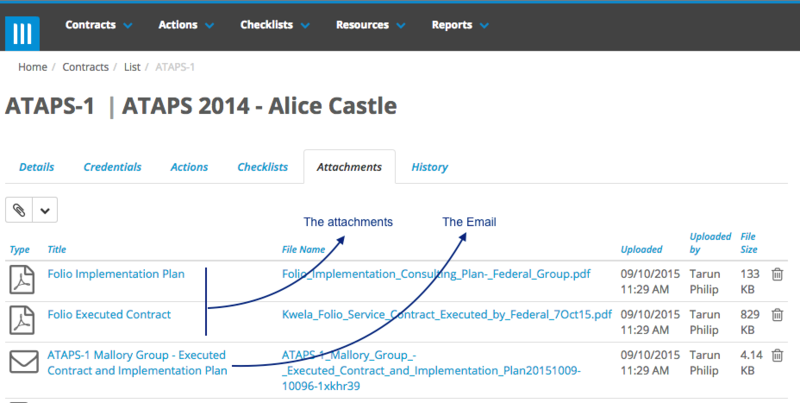 Folio will keep all their contract documentation easily accessible, in one place. The team at Kwela use this feature all the time. Here is an example of how I handled an executed contract emailed to me by a new client. First, I used my unique Email to Folio address and sent the email to Folio. Folio received the email and processed it, it split the email and the attachments up and placed them against the contract. All this, while I made myself a cup of tea! Back at my desk with my tea and biscuit in hand, I got an email from Folio to say that it had successfully uploaded the email that I sent to it. Happy days! Why don’t you try this new folio feature today!